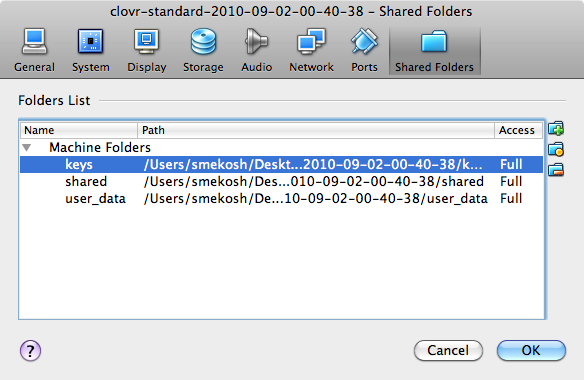 Depending on your setup, you may need to adjust where VirtualBox (and CloVR) look for your shared folders. To add these, click on the VM window and select “Shared Folders” from the “Devices” tab. For each folder listed, click on the “Edit Folder” icon (the middle folder icon with the yellow dot) and edit the “Folder Path” so that it matches the path on your computer to the corresponding folder. 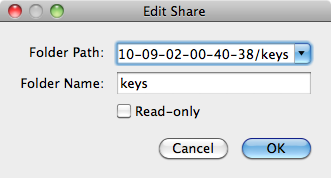 For example, the “keys” shared folder should point to the “keys” directory within the CloVR image you used to set up CloVR in VirtualBox. Repeat this procedure for folder keys, user_data, and vappio_conf. On VirtualBox, CloVR will automatically use a “bridged adapter” for networking. This is the preferred networking setting because it allows both outgoing and incoming connections. Unfortunately, bridged networking may not always work, particularly if you are using a wireless Internet connection on a laptop. If this is the case, you can change the setting to use “NAT” networking. This will enable outgoing network connections to the Internet and your local network but not incoming connections to the VM. However, using “NAT” will prevent you to use the web browser to access CloVR running on your laptop/desktop. In addition, you can’t even SSH into your CloVR image. If you use “NAT” option, you are confined to the “Terminal” in CloVR image. To enable “NAT” networking, first shutdown your CloVR VM, select the CloVR image on the VirtualBox welcome screen and click the Settings icon. 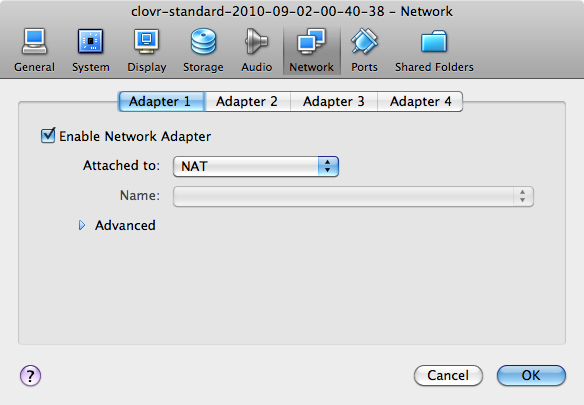 Click the “Network” tab and change the “Attached to” field from “Bridged Adapter” to “NAT” and then click “OK.” Start up the CloVR VM again to use the new network settings. At the terminal within the CloVR VM type “lynx”. Select VM “Settings” , “Network”. Select “Bridged adapter” instead of NAT. 3)If the CloVR VM successfully obtains an IP address but you still can’t access it. Attempt to restart networking using the following command. At the terminal within the CloVR VM type “/etc/init.d/networking restart”. You should see an ip address eg. “bound to 10.90.136.2”.